The CoffeeShop Blog: CoffeeShop Facebook Cover Blank Template! 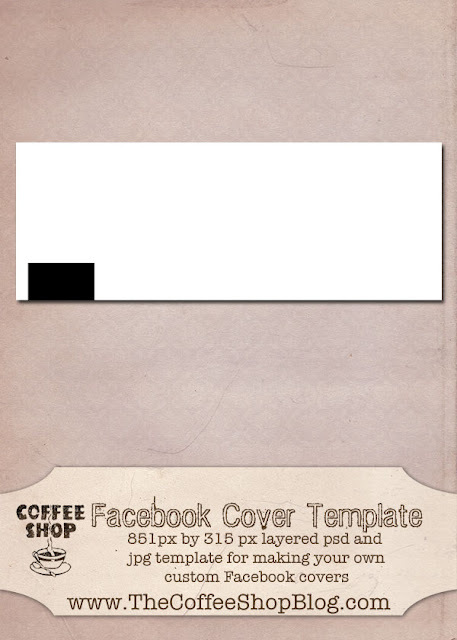 CoffeeShop Facebook Cover Blank Template! We are still trying to get the last bits of our stuff moved from the old house to the new (why in the world did I not just pack everything up for the movers to move? ), but the new house is finally starting to feel like home. Every time I move I plan on going through stuff before I box it up, but I get impatient and decide that I will just move it all and go through it later. And of course once it is boxed up and in the closet in the new place I forget about it and it just gets moved once again. And now that I have kids the amount of stuff is getting bigger and bigger. I just tell myself that one day I will have more free time because the boys will be bigger or I will have empty nest syndrome and have plenty of time to go through all of my old junk. I hear stories from so many of my friends and family members about their moves and how it would take years for them to get everything where they wanted it. These stories comfort me and make me feel less guilty about not having pictures on the walls yet and still having problems finding the extra toilet paper. My sister in Austin (the one who said she likes to move so she can clean out junk) moved recently and within a week her house looked like a home with pictures on the wall, rugs in their appropriate places, and books sorted and placed on bookshelves. And she had plenty of toilet paper stocked in each bathroom (she must be a witch!). She also has two kids and is a wonder woman. She has a unique talent of making any place look like a cozy home almost immediately, while I can live in the same place for seven years and still have blank walls. I need her to come visit and help me design this place! Even though I am having to get adjusted in being in a neighborhood in town after living on acreage for almost seven years, we are just a few minutes from an actual Main Street of the small town I grew up in with all of its beautiful parks, amazing small family-owned restaurants, and free festivals. We are also still close to friends and family, so that made the move easier. And our new house is really nice (with no green shag carpeting or avocado green ovens) with plenty of trees and and a big yard for the boys to run around and play. And fortunately my parents live 20 minutes away on 30 acres of woods with creeks and plenty of climbing trees, trails, and assorted snakes and bugs. So my boys will still be country kids which is really important to me. Did I tell you that my parents took a dozen of my favorite chickens? They had an old bird aviary my husband converted to a hen house. My chickens love living out there and have become so tame. And I still get fresh eggs! I hope to get completely moved in the next week or two or three and then I will have more time to create and blog. Not to mention feel less stressed because the work will finally be done and we can have our weekends back. I miss our normal life! But I did have some free time today to make a little freebie for you. I made a simple blank Facebook Cover Template that is the maximum size (851px by 315px) so you can create your own custom covers. I included a simple jpg where you can add your image/text above the background and also a layered psd which has an layer for the little photo profile on the left side so you can make sure important parts of your cover are not covered by your profile picture. The profile picture layer is turned off, but you can turn it on to see what part of the cover is getting covered up by it. Download the free Facebook Cover Blank Template! You can also download it here. You made your town sound so wonderful, I want to pack up and move there, too. And, I HATE to move! Thank you so much for this post. I want to let you know that I posted a link to your blog in CBH Digital Scrapbooking Freebies, under the Page 3 post on Mar. 26, 2012. Thanks again. Thank you. It is hard settling into a new place. I'm sure I have a box or two that was moved and moved again that is still in the shed....waiting for me to go through it. Thank you so much! Your hard work is sincerely appreciated and admired! Wow, so glad to have found your site! I've been making FB cover photos for giveaways, too. It's a fun, creative outlet.